Hi, all! A lot of you probably know me from over on my blog, rosebfischer.com. Either way, I’d like to take a minute to introduce myself and thank Gene’O for inviting me to contribute here on Sourcerer. I’m Rose. I write speculative fiction, and I blog about nearly everything, including books, pop culture, and storytelling. In the last year or so I’ve been writing and blogging a lot about social issues like Disability Awareness and homelessness. If you’re interested in those topics, feel free to pop over and visit. One of my personal flavors of geekery/nerdiness/whatever is cartoons. Western styles of animation are my bag. I don’t care much for anime/manga. I guess I can’t ever conform to stereotypes. This project started as an idea about a retrospective on 80s cartoons. In my not so very humble opinion, there’s only one place to start when looking at animation in the 1980s. Disney Studios was in an animation-lull. A few animes had made their way over from Japan, but they didn’t become explosively popular until the mid-to-late portions of the decade. We had a handful of Hanna-Barbera productions running, but most of those were properties from the 60s and 70s that were still being recycled on Saturday mornings. On weekdays, Popeye, Tom and Jerry, Looney Tunes, and a handful of other well known cartoons, but again all of those were recycled shorts from the 60s and 70s. When it comes to animation, the 1980s were age of He-Man. 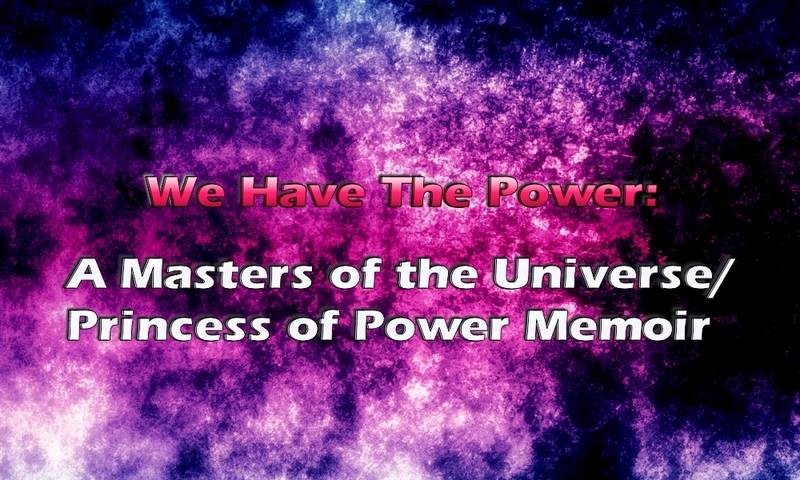 Masters of the Universe and its spin-off series Princess of Power were game-changers. There was nothing like them before, and the success of those shows is directly responsible for the way cartoon series are produced and marketed today. My own relationship with MOTU/POP began with fascination and adoration in 1982, dissolved into weariness and exasperation by the 90s (because the shows were still being aired six times a day in re-runs) and suddenly rebounded in the early 2000s when I discovered something called The He-Man and She-Ra Episode Review Website. It’s now defunct, partly merged with he-man.org and partly revived on the He-Man and She-Ra Blog. I’d like to share more about this with you in the coming weeks. I’ve got six posts to run over the next twelve weeks. Depending on how they go, I’ll have some more and will eventually be expanding from He-Man and She-Ra to other cartoons of the 80s and 90s. I’ll be kicking things off in two weeks. If you want a taste of my pop-culture writing before that, drop on over to my blog and take a look at this series, which is also (coincidentally) about He-Man. Every post, I’ll try to feature a fan-artist who’s still actively engaged in MOTU/POP artwork. This week’s feature is by thesilvabrothers @ DeviantART. You can click the image to view full size on their gallery at DeviantART. This entry was posted in Bylines, Masters of the Universe, Rose B Fischer and tagged animation, art, cartoons, Entertainment, He-Man, Masters of the Universe, MOTU-POP Memoir, pop culture, She-Ra, the 80s, tv by RA Stone. Bookmark the permalink. I so wanted to be She-Ra and to grow up and marry Man-At-Arms. Ah, happy days! My first fanfic…ages before I knew what “fanfic” was…was a He-Man/She-Ra epic for my siblings. 1. I share the “can’t wait” sentiment that I am picking up from this thread. 2. I was skating into “too old for kidstuff” territory when He-Man hit, but loved it anyway. I was a Star Wars baby with a Bee Gees lunch box in a world with no mass media except TV and print, and cable hadn’t even hit big in 1982. By the time this really became a craze in my locale, I was thinking about a driver’s test and whatnot. But I do still have my Battle Cat and Teela (she was my favorite) action figures with all their accessories stashed away in a safe place. And my brother and cousins who were only 3-5 years younger than me went absolutely bonkers for it. 3. I do not say this kind of stuff often on the public threads, but I am expecting this to be a winner. That is based on the overall nostalgic vibe I am picking up from the response, and from the sharing of this post I’ve seen today. Also, Rose. I think you are right about the significance. I grew up watching all that recycled stuff and never heard of a weekday afternoon cartoon until I was almost 12. Beverly Hillbillies and Andy Griffith is what I got after school. MOTU was absolutely a game-changer, if my anecdotal memory is worth anything at all. I was never much for He-Man, I had too much love for the Thundercats. As a kid, they seemed mutually exclusive to me. That said, Skeletor is awesome. What do you think of the Skeletor is Love tumblr?